This is me wearing my newest skirt. It is an incredibly basic skirt, so I wrote up a quick tutorial, but I'm mostly here writing about my love of the fabric. I bought this fabric several years ago after finding a bolt of it in a going-out-of-business clearance frenzy. My husband loves dinosaurs, and I made him a paintbrush roll-up out of it (FYI here's a tutorial for a roll-up). The rest of the fabric sat on my shelf over the years and I never could decide what to do with it. The dinosaurs were painted by James Gurney and used on a series of postal stamps called the "World of Dinosaurs" that came out in 1996. James Gurney illustrated the Dinotopia book series, and is obviously quite skilled at dinosaur painting! Here's his blog. I wanted to make a skirt out of it in the past but kept hesitating because I couldn't see myself wearing dinosaurs around town. But now I'm more awesome, so I can see myself wearing dinosaurs around town. A lot of people don't notice it's dinosaurs at first (or at all), thinking it's just an earth tone print, but I like it when it hits them that yes, it is a T-Rex looking at them. So here's how to make yourself a simple elastic waist skirt out of some quirky fabric. 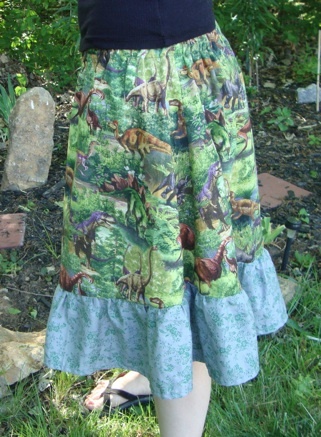 If you make a really quirky skirt, email me a picture because that would make my day! 2. Unfold the two skirt halves, lay them on top of each other right sides together and sew up the sides. Iron the seams open. 3. Make the casing for your elastic. To do this, iron down the top of the skirt about 1/4" or so, then fold it down about an inch (or however wide your elastic is) and iron it again. Sew it down all the way around the skirt, leaving a gap somewhere to insert the elastic. 4. Optional--Add a ruffle edge to the bottom. This is just a long strip of fabric gathered on top to fit the bottom of your skirt. I cut two long strips and sewed them together to form a ring. I lined up the two seams on this ring to the two seams on the bottom of the skirt and then gathered up the top of my ruffle until it fit. Sew it down. 5. If you haven't already, hem the bottom of your ruffle and/or skirt. 6. Use a safety pin to insert the elastic into your casing (measure it by holding it around your waist where you want it to sit, pulling it as tight as you feel comfortable), sew the ends together, then sew closed the gap you left open. Bam. You have a skirt! I love it!I found you through James Gurney's blog. Love his art! Anonymous because I didn't want to sign in. The flower skirt is stunning!